Showcasing ancestry and genealogy with video! You have the records. 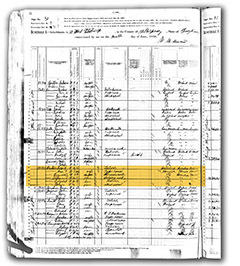 How do you make those dusty genealogy & ancestry documents come alive? Maybe you're lucky to have someone who can speak to the old days, or recollect their own early days. What now? The answer is genealogy video. See how three of our recent projects came together in the following case studies to get this exciting new idea: "Living in History", "Boston Boy". as Susan P - an avid genealogist & family historian. Is it a choice between a written history and a video family history? Not at all - the two go hand in glove! We rely on the written history (when we are lucky enough to have one) to create the genealogy video. Often, we include the family history - up to 10,000 words - as an accompanying DVD booklet (the written word being the hand, the DVD case being the glove...). So because he had so much local knowledge, in Bob's genealogy video we filmed him visiting some of his local haunts! Bob Albee lives in Boston. Bob's genealogy research had been on-line - as well as on foot. He has the good fortune to be living in New England within mere miles of towns founded by his ancestors. And he lived close to graveyards where the bones of those ancestors have lain in shady repose for hundreds of years. Short extract of an ancestry video made about the Giacchino family tracing their roots back to Italy. When John Giacchino came to us and asked us to help him present the results of his ancestry research, we knew what to do. His great grandparents had all come from Italy around the turn of the century and John had great documentary material going all the way back to Italy. Mom and Dad were key - the link between their grandparents and the Italian-American grandkids. So the genealogy video starts with Mom and Dad making home-made pasta and meat balls. Dad tells how the recipes have been handed down, but also changed. His son makes pasta, but just a little different to him (the son uses pre-packaged garlic, to Dad's horror!). Your Story Here helps you present the results of your genealogy and ancestry research in stunning new ways. We combine photos, maps, interviews, vital records, narration, home video, music - and even traditions like cooking - into an informative family history documentary. Been researching? Make your work come alive - for yourself and your family - and for the generations to come. Check out the three genealogy video case studies and samples on this page and give us a call to talk about your project. Genealogy, ancestry & family history video documentary. Ancestry.com has helped open up a whole new window into our families' past. Genealogy may be America's fastest growing hobby. And with the growing popularity of DNA testing, the trend is only accelerating. The basis was probably laid over the last decade with mainstream ancestry video shows such as "Who Do You Think You Are" (NBC) and "Faces of America" (PBS). But you don't need to be famous to create your own ancestry video. Use these simple tools and tips to create your own private family history documentary. Our fascination with genealogy and ancestry may be reaching its modern apotheosis with the recent spate of lavish genealogy video shows. Their production values are very high, the discoveries dramatic, and the subjects are all well known, charismatic and accomplished individuals in their own right (a generous sprinkling of TV and film stars among them). Of course, these current shows are far from the first family history documentaries to grace our television screens. Before "Who Do You Think You Are" and "Faces of America", we had "Roots", "History Detectives" and "African American Lives", to name just a few. But our obsession with genealogy started well before these recent and undeniably entertaining genealogy videos. The genealogy bug, it turns out, is very ancient. Before people had television they had the bible (and a good thing too, many will intone). Instead of collapsing into the sofa, reaching for the remote and staring at "Who Do You Think You Are", folks took the Good Book out of the cupboard, turned to the pages of 1 Chronicles, and had fun reading about genealogy ("And Joktan begat Almodad, and Sheleph, and Hazarmaveth, and Jerah..."). Many a worthy neophyte must have come to grief (or fell asleep) slogging through that marvelous feat of ancestry. Luckily, the genealogy of Jesus - covered in the gospels of Matthew and Luke - is much shorter (although a little different in each). What is new in genealogy is not our interest in the subject, but our ability to make the material which we have interesting and accessible. And we can thank the explosion in public genealogy video for that. Because in most families, there is a person who is the genealogy researcher who has the skills, patience and (forgive me) doggedness to track down the branches. And then there are the genealogy appreciators - the audience. These goodly people would never do the genealogy research themselves, but are more than happy to share in its results. But how do you make those results compelling? Genealogy video? "Pshaw," some of you will be saying. "It took me countless hours to gather all this genealogical material, and it runs to hundreds of pages. It should take them countless hours to read it!" Maybe. But baby needs to crawl before she can walk. You must draw them in to the story first. So, family history documentary. The attraction of these video editing programs for genealogy is that you can include all of your genealogy related material - of whatever kind - in the one place: documents, information (either as captions or narration), photographs, old film, new film (maybe an interview with a family member or maybe you have film of a visit to the ancestral village), audio recordings of folks who have passed - you name it. You can add music and poems; it really is like a kind of three-dimensional digital scrapbook. As well as some video editing software, you will need a scanner to digitize your documents and photos. And you may want to fix the photos up a tad first. And you will need to digitize and bring any audio and video into the computer if you want to include it in your ancestry video. Once all that's done, you edit it all together. A word of warning - video editing is a learned skill. It takes a bit of time and patience to get the hang of it. And if your computer is more than, say, 5 years old it will probably lack the processing power to edit video. (Older computers are a common reason many people give up on their own genealogy video project - often blaming themselves.) But if you really want to make that genealogy video you may need to (gulp) invest in a new machine. Once completed, you can post your ancestry video to the web - using YouTube or anyone of endless video hosting services. You can send a link to the cousins across the country or across the world. You can make a copy that fits on the iPod or on one of these newfangled cell phones. Or you can just burn a bunch of DVDs. So use the inspiration provided by these new bright and shiny ancestry video shows currently playing on TV to think about your own genealogy video. Think about how you could incorporate your own genealogy material into a video of your own. To understand the history of your tribe, you don't need to make the kids sit down and plow through 1 Chronicles. You can make a genealogy video every bit as thrilling.